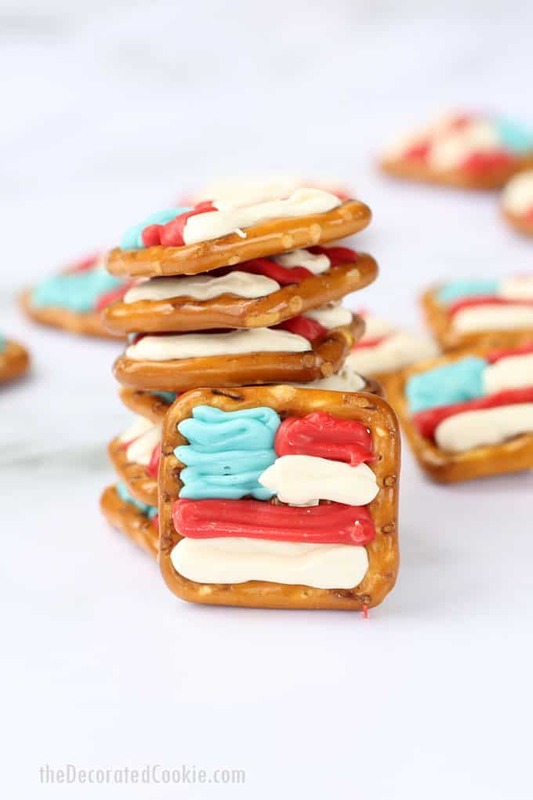 These American flag 4th of July pretzels are easy to make with red, white, and blue candy melts. 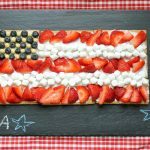 Need a quick and easy treat or snack to serve on the 4th of July? 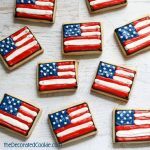 (Note these of course also work on Veteran’s Day, Memorial Day, and any time you feel a burst of patriotism.) 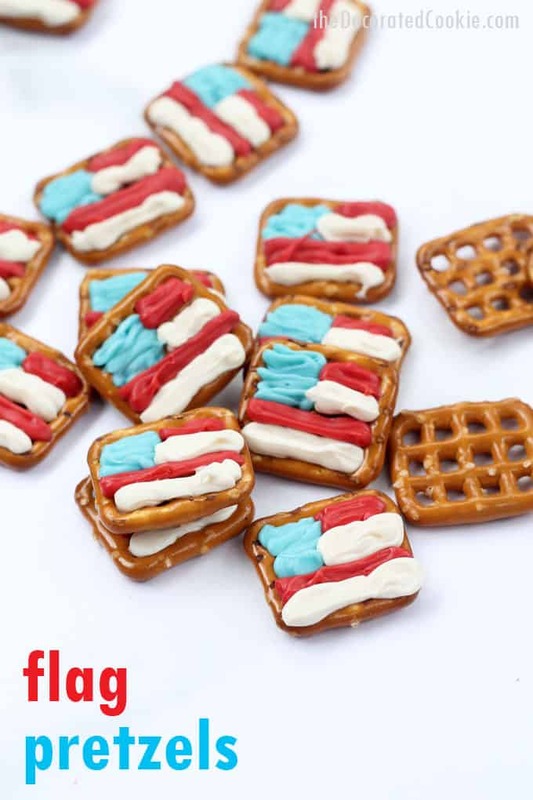 Try chocolate-covered flag pretzels. 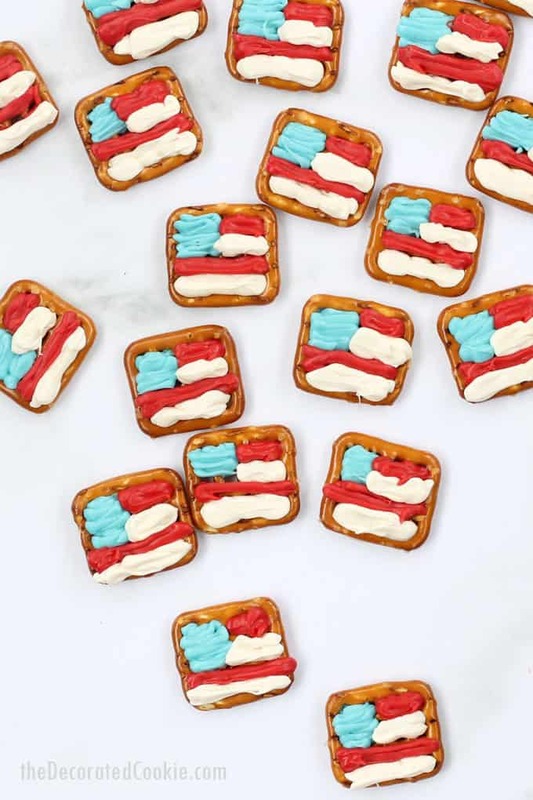 All you need are some snaps pretzels and candy melts to make these no-bake 4th of July pretzels. 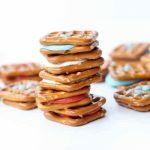 I prefer working with candy melts (candy wafers with the consistency of chocolate) because they melt easily and harden quickly without refrigeration. However, if you prefer to work with white chocolate, you may tint some of the chocolate red and white. 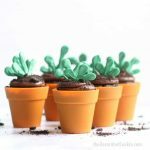 Do NOT use regular gel paste food coloring. 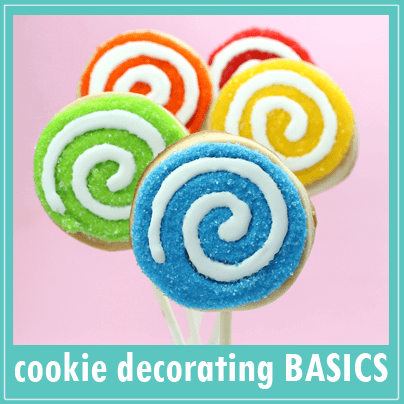 For best results, use oil-based candy color in red and blue. If you are using white chocolate, do NOT melt the chocolate directly in the decorating bag, as it will get too hot. Melt in a bowl and transfer to the bag when it’s cool enough to handle. 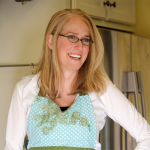 *If you are using white chocolate instead, see tips above! 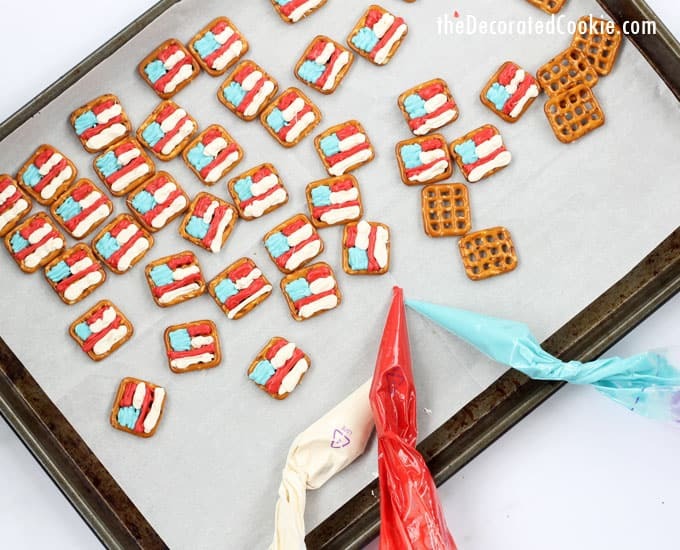 To make your 4th of July pretzels, first arrange pretzels on a baking tray lined with parchment or wax paper. Place about 1/2 cup of blue candy melts in a decorating bag. Microwave at 70 percent power for 90 seconds, massage the bag, and continue to microwave at 15 second intervals until fully melted. 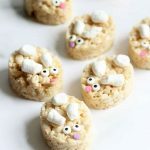 Be sure the candy does not get too hot! Snip the tip and pipe a blue square in the corner of the pretzels. Next, melt the red candy and pipe two stripes. Finally, melt the white candy and pipe stripes. Let the pretzels sit until fully hardened, about an hour. 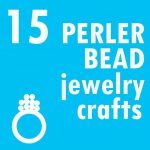 Arrange pretzels on a baking tray lined with parchment or wax paper. 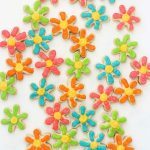 Place about 1/2 cup of blue candy melts in a decorating bag. Microwave at 70 percent power for 90 seconds, massage the bag, and continue to microwave at 15 second intervals until fully melted. 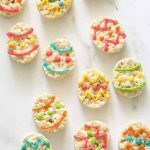 Be sure the candy does not get too hot! Snip the tip and pipe a blue square in the corner of the pretzels. Next, melt the red candy and pipe two stripes. Finally, melt the white candy and pipe stripes. Let the pretzels sit until fully hardened, about an hour. 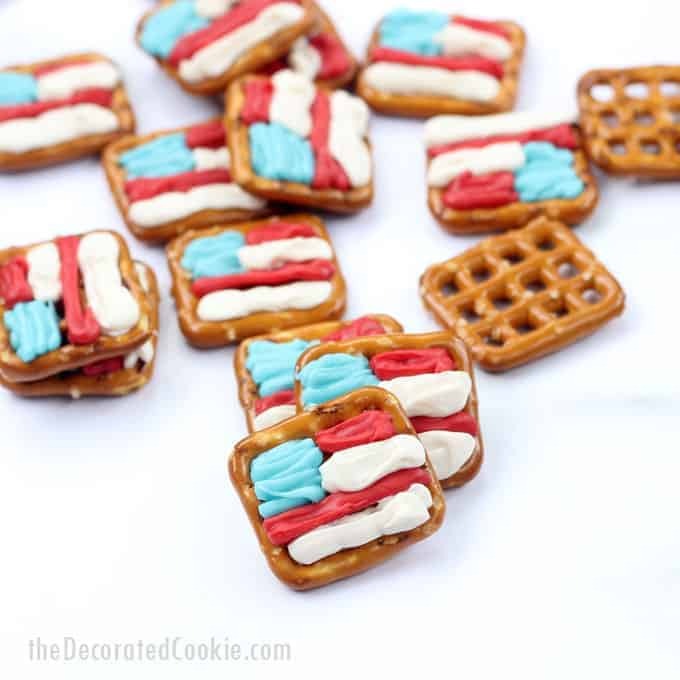 Sure, 4th of July pretzels are great and all, but if you’re hosting a party and need lots more red, white, and blue food, I have some for you. 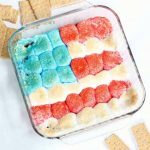 Try this popular American flag s’mores dip. Or, these red, white, and blue marshmallow pops. 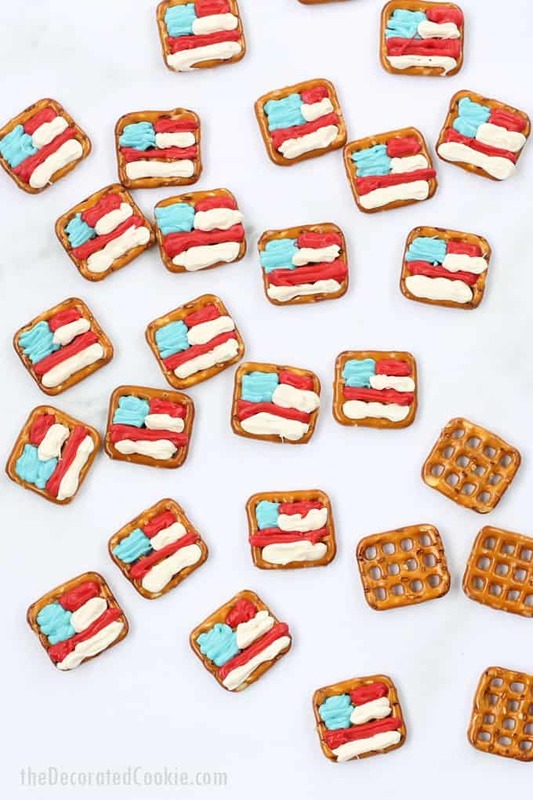 You can also make these patriotic pretzel bites with the same ingredients.